Come play with the Headless Horseman at Halloween. 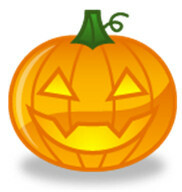 Help the Headless Horseman stop the Evil Scarecrow from smashing all the jack-o-lanterns! Run back and forth with the Headless Horseman using the left/right arrow keys and bounce the pumpkins safely into their box. Use the space key to hit the direction and power level you want.